At the moment all this ceases to be relevant because of the rapidly evolving Internet, various online publications dedicated DX-ing, amateur radio forums and other sources of information, so keep this section as an archive, which will help all the same that you can look at ways to QSL from getting DXs, how this should invest DX payment and in what form, well, just to see, but is it possible to get from him QSL card (or do not get). All sent out QSL-cards are sorted by year, indicated in the table: QSL-manager, date of dispatch / receipt date (if the date of receipt of the dash, then the response card has not yet been received), which way sends QSL (direct, bureau or the other way ), which invested in the envelope for what went cards. The idea of assistance to obtain QSL cards appeared long time ago in the 80s of 20 century, when directly card was difficult to obtain. It all started with the fact that the Yankees sent us one instance of W6GO/K6HHD List. 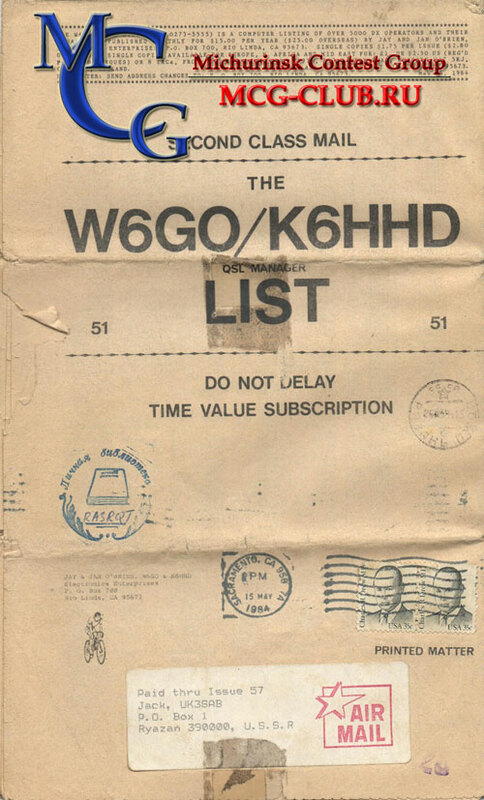 This sheet of qsl-managers was read literally to pieces, as well as the bulk of the Soviet hams if such information was not available, RN3RQ decided to open the QSL-service to obtain cards from DXs. Then, through a Japanese friend managed to put my RA3RQT address to American callbook (which at the time was a rarity), and when this call-book was purchased through third parties, joy knew no bounds. I only want to remind you that all this happened in the days when the QSL exchange was only via CRK radioclub in Moscow, and to send and receive QSL directly were strictly forbidden.